Walt Whitman's poetry is a continual source of inspiration for me. Whitman's life story is also deeply moving. 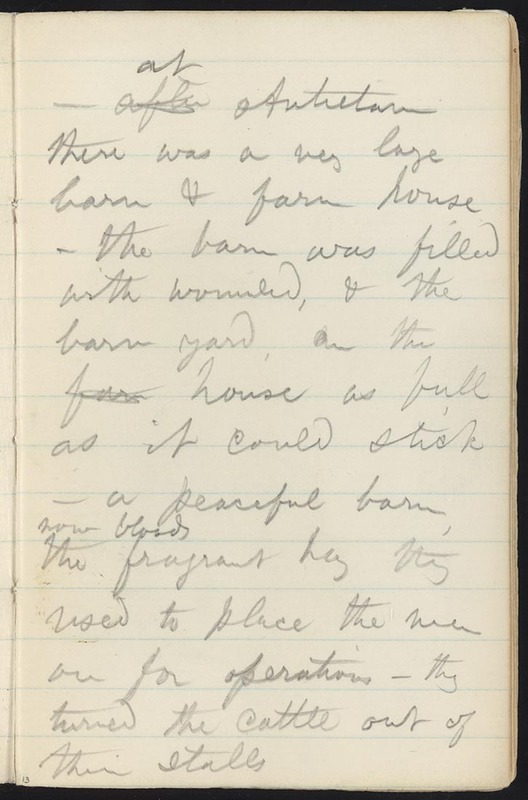 In December 1862 Walt Whitman saw the name of his brother George, a Union soldier in the 51st New York Infantry, listed among the wounded from the battle of Fredericksburg. 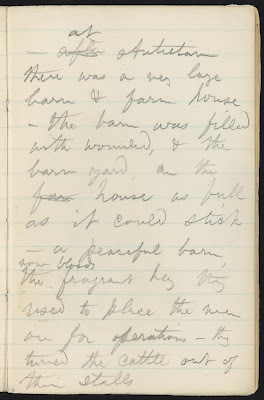 Whitman rushed from Brooklyn to the Washington D.C. area to search the hospitals and encampments for his brother. During this time Walt Whitman gave witness to the wounds of warfare by listening gently to the injured soldiers as they told their tales of battle. Whitman often spent time with soldiers recovering from their injuries in the Patent Office Building (now home to the National Portrait Gallery and Smithsonian American Art Museum), which had been converted into a hospital for much of the Civil War. Walt Whitman's experiences in Washington deeply affected his life and work and informed the core of his writing. Robert Roper's Now the Drum of War: Walt Whitman and His Brothers in the Civil War is an indispensible account of Whitman's time in Washington during the war. Roper's book examines the Civil War through the experiences of Walt Whitman and provides new findings on the care of wounded soldiers both on the battlefield and in large hospitals in the capital and its environs. Roper also focuses on Whitman's emotional relationships with the wounded troops he nursed. Walt Whitman journeyed from New York to find his wounded brother George and in the process Walt became a brother to thousands of wounded comrades. Whitman's volunteer work as a nurse during the Civil War is a story that needs to be told in all mediums. We were not meant to survive. We were meant to live. A Balance of Shadows was begun in 2004 as a visual poem reflecting the tensions of our era. Today, May 24, 2012, I laid a thin transparent layer of lapis lazuli across a section of the sky. Sourced in Afghanistan, this precious stone, when ground into pigment, creates a radiant blue that has been considered auspicious in both east and west. The word depicted in Japanese script in the upper left section of the painting is satori. The word satori is a Japanese Buddhist term for enlightenment or "understanding". In the Zen Buddhist tradition, satori refers to the experience of kensho. Kensho when used in Zen traditions refers to "seeing into one's true nature." Ken means "seeing," sho means "nature" or "essence." Satori and kensho are commonly translated as enlightenment, a word that is also used to translate bodhi, prajna and buddhahood. A series of interactions between this painting and viewers worldwide has taken place on the web. Poets, writers and artists from Brazil, to Hong Kong, to Greece, to the Netherlands have interacted with the painting in online dialogues. I have traveled widely in my quest to understand the international connections between east and west. 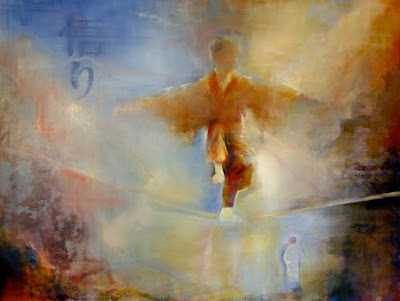 These global interactions inflect my understanding of the painting and help me understand my need to create this work. Throughout my life I have been compelled to create artworks that depict a world caught between color and elegy, between memory and dream. Inspired by the Buddhist practices of people across the globe, I have created images referencing Thailand, Cambodia, Vietnam, Singapore, Malaysia, Indonesia, Korea, Japan, Burma, The United States, India and China. These artworks seem to depict a world in which humanity struggles not just to survive, but to live. My paintings bring out questions. What does it mean to honor the space between seeing and being? What is the place of beauty in the modern world? Where is the space for contemplation in contemporary life? 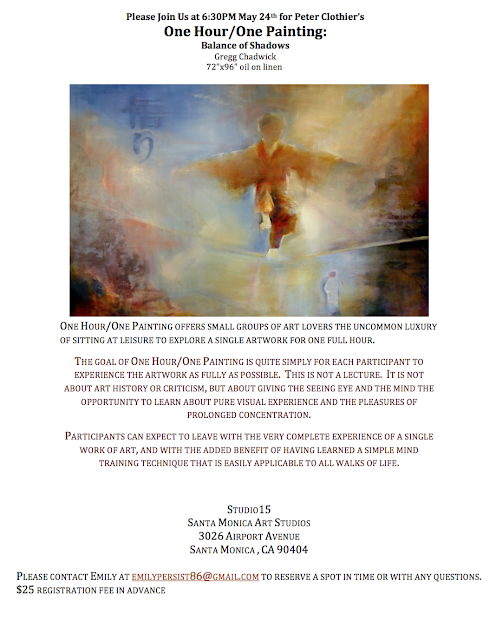 I am honored to invite you to register for the next One Hour/One Painting Art Meditation Session which will be led by the distinguished art writer Peter Clothier at 6:30pm on May 24th, 2012 in my studio at the Santa Monica Airport. Peter has recently hosted One Hour/ One Painting sessions at the Diebenkorn: The Ocean Park Series exhibit at the Orange County Museum of Art and at the LA Louver Gallery. When describing Peter Clothier's sessions, I am often asked what to expect. In short, Peter will guide a small group of people through an exercise in 'concentrated looking' over the course of one hour's time. He will do this by taking us, as individuals in a group, on a visual and contemplative tour of my large, six by eight foot, painting A Balance of Shadows. We will experience color, shape, space and image in a concentrated yet calm and meditative manner using our eyes and minds. I see this as an 'exercise in learning how to see' or 'how to see more deeply' rather than an exercise in the making of an art piece. To clarify, we will not be making a painting of our own during this session. 415 533 1165, Peter's assistant Emily at emilypersist86@gmail.com, or Peter Clothier at peterclothier@mac.com. I hope to see you at my studio on May 24, 2012. Peter Clothier's latest books are Persist and Mind Work. "Nice people can be strong. And happy people can be smart." As the June 5, 2012 recall elections creep closer in Wisconsin, important political realities are becoming evident. Governor Walker, his Wisconsin loves me bluster nevertheless, will most likely be recalled. And Scott Fitzgerald, one of Governor Walker's key supporters in the Wisconsin State Senate, is scared for his political future and could be on the road to political irrelevance. Shockingly, in the June 5 recall election race for Wisconsin's 13th District, Fitzgerald is afraid to debate his opponent Lori Compas. Not only is Fitzgerald scared of Compas, he revealed himself to be an out of touch and misogynist candidate by saying that he is sure that Lori Compas is a puppet for her svengali husband as well as unions and protest groups. "I don't for one minute believe she is the organizing force behind this whole thing." Fitzgerald said in the Mothers Day Edition of the Wisconsin State Journal . When told of Fitzgerald’s statement, Compas was stunned. In the opinion of my Wisconsin friends and family, Lori Compas epitomizes the future of Wisconsin in her measured, inclusive, intelligent ideas. It seems that Fitzgerald has forgotten one of the most important axioms in politics: Never underestimate your opponent. On June 5, 2012 expect a record turnout for the recall elections. And mark my words, this record crowd of voters young and old will be led by the women of Wisconsin. Mitt Romney vs. a young David Bowie? "A high school classmate of presidential candidate Mitt Romney told ABC News today that he considers a particular prank the two pulled at Michigan’s Cranbrook School to be “assault and battery” and that he witnessed Romney hold the scissors to cut the hair of a student who was being physically pinned to the ground by several others. 'It’s a haunting memory. I think it was for everybody that spoke up about it … because when you see somebody who is simply different taken down that way and is terrified and you see that look in their eye you never forget it. And that was what we all walked away with,' said Phillip Maxwell, who is now an attorney and still considers Romney an old friend." Romney's actions show an almost pathological lack of empathy. We need empathy not cruelty in our President! We need a POTUS who accepts all persons equally! Hat tip to Eric Kleefeld! Happy 18th Birthday to My Wonderful Kid - Cassiel Chadwick! Happy 18th Birthday to my University of California Berkeley bound Cassiel Chadwick! "Happy Hills is my body of work documenting the predominantly hispanic workforce, who work tirelessly behind the scenes to present the beautiful images of the ideal Hollywood Hills homes." 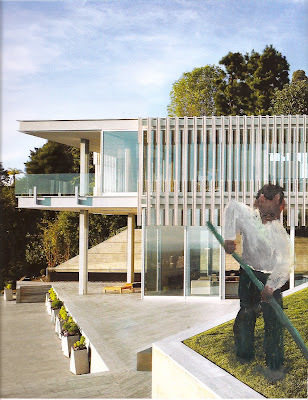 The artwork of the young Los Angeles based artist Ramiro Gomez reveals the unseen hands and faces of the often underpaid and under appreciated laborers who keep the more affluent areas of the Los Angeles basin manicured and green. Using the simple materials of cardboard and paint, Gomez creates labor portraits of the hispanic workers that work behind the scenes at posh hotels and trendy restaurants. With a utility blade, Gomez cuts out these almost Hockney like figures and then places them in public settings where his artistic subjects work. These artistic interventions are witty, respectful, and deeply provocative. Ramiro Gomez also creates smaller works on paper that utilize pages from lifestyle magazines. 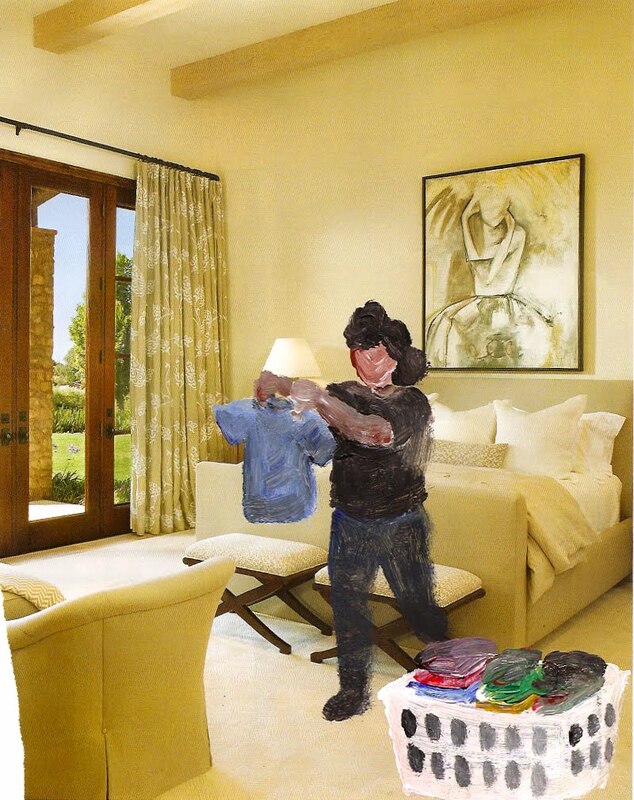 These small scale interventions include figures of laborers that Gomez documents in acrylic paint. If you are in the Los Angeles area and driving through Beverly Hills, take note of the workers who often remain unnoticed. Ramiro Gomez' artwork is a powerful reminder to remain attentive. "A recent UCLA study found nearly 75% of child care workers and 35% of maids and housekeepers in Los Angeles County were paid at an hourly rate lower than the minimum wage. Many home health care workers (97%) and child care workers, maids, and housekeepers (87%) also reported being required to work when they were not on the clock - that is, they did not get paid for all of the work they did, according to a Research & Policy Brief from the UCLA Institute for Research on Labor and Employment." 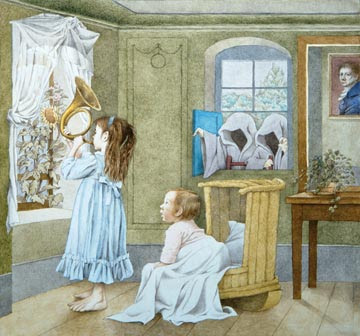 Maurice Sendak was an artist in love with the world and with things that go bump in the night. Sendak looked deeply at the world around him. His vision included the visible nature of our existence and the invisible, but no less real, world of dreams. Sendak's beautifully crafted artworks for his books began with simple pencil sketches that were then enlarged and fleshed out with pen and ink which was then layered with glowing watercolor washes. 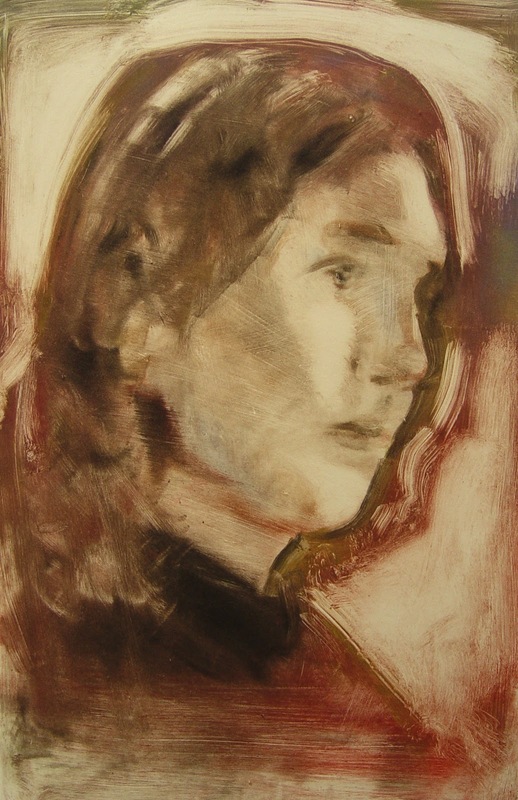 The finished paintings on paper reflect what Dave Eggers described in a Vanity Fair article on Sendak as the "unhinged and chiaroscuro subconscious of a child." Sendak's books and images appealed to readers of all ages. 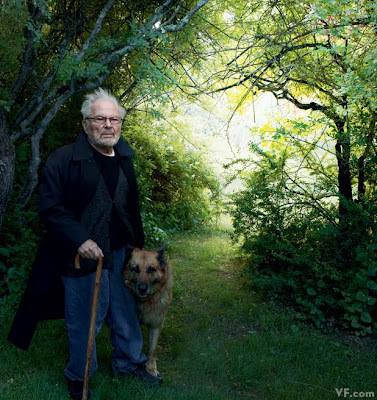 Sendak took the deep mysteries of life head-on and allowed us all to journey to where the wild things are. "Yes. I'm not unhappy about becoming old. I'm not unhappy about what must be. It makes me cry only when I see my friends go before me and life is emptied. I don't believe in an afterlife, but I still fully expect to see my brother again. And it's like a dream life. I am reading a biography of Samuel Palmer, which is written by a woman in England. I can't remember her name. And it's sort of how I feel now, when he was just beginning to gain his strength as a creative man and beginning to see nature. But he believed in God, you see, and in heaven, and he believed in hell. Goodness gracious, that must have made life much easier. It's harder for us nonbelievers. But, you know, there's something I'm finding out as I'm aging that I am in love with the world. And I look right now, as we speak together, out my window in my studio and I see my trees and my beautiful, beautiful maples that are hundreds of years old, they're beautiful. And you see I can see how beautiful they are. I can take time to see how beautiful they are. It is a blessing to get old. It is a blessing to find the time to do the things, to read the books, to listen to the music. You know, I don't think I'm rationalizing anything. I really don't. This is all inevitable and I have no control over it." We are fortunate that Maurice Sendak's love for beauty and the mystery of existence forged a unique vision that led to his magical books and images. He will be greatly missed. 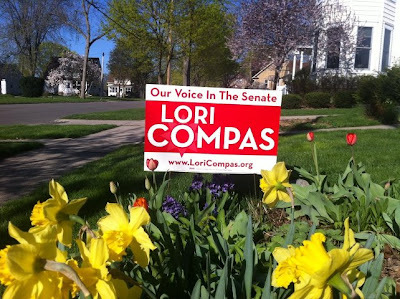 On A Serious Note: Tomorrow - May 8 2012 - Please Vote for Lori Compas in Wisconsin's 13th Senate District! For my friends and family in Wisconsin and across the United States. Please support Lori Compas in her May 8, 2012 election for Wisconsin State Senate in Wisconsin's 13th Senate District! 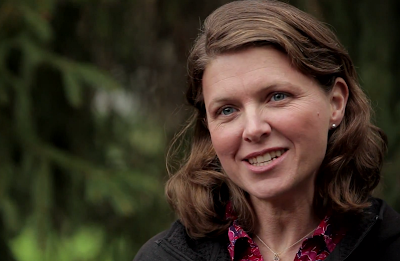 Find out how Lori plans to restore honesty and integrity to Wisconsin's political system. Don't fall for Scott Fitzgerald's tricks: The person running against me in the primary is a FAKE DEMOCRAT. His name is Gary Ellerman and he's a Fitzgerald supporter. 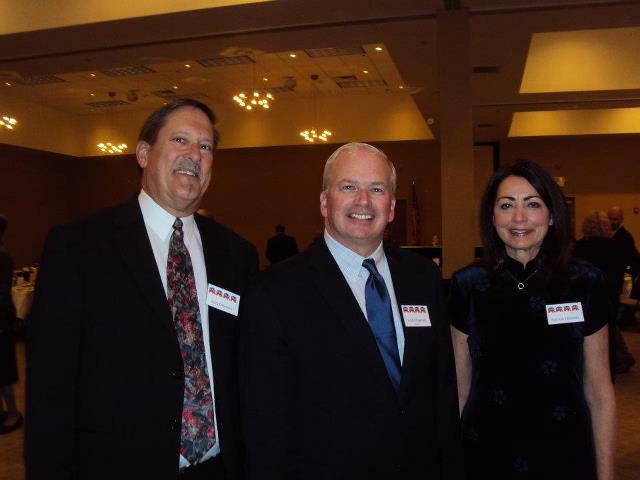 This photo of him with Scott Fitzgerald is all over the internet -- it was taken at the 2012 Jefferson County Republicans' Lincoln Day Dinner. As you can see he has the GOP elephants on his nametag. And yet his name will be on the primary ballot with a D after it -- this is a lie, plain and simple. Please tell your friends. I am always on the lookout for passionate new artists. I remember when I first heard a demo tape from a band called the Himalayans which morphed into Counting Crows. I almost wore out that cassette as I drove around San Francisco just to hear those songs. 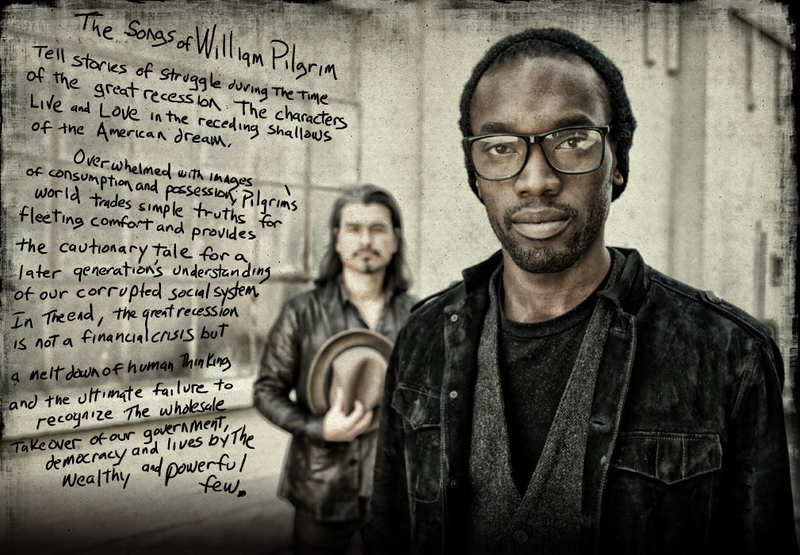 I got a similar feeling when I first heard Ishmael Herring, singer-songwriter of William Pilgrim & the All Grows Up. This is a band to watch! Loving the song "Water When the Well Is Dry". 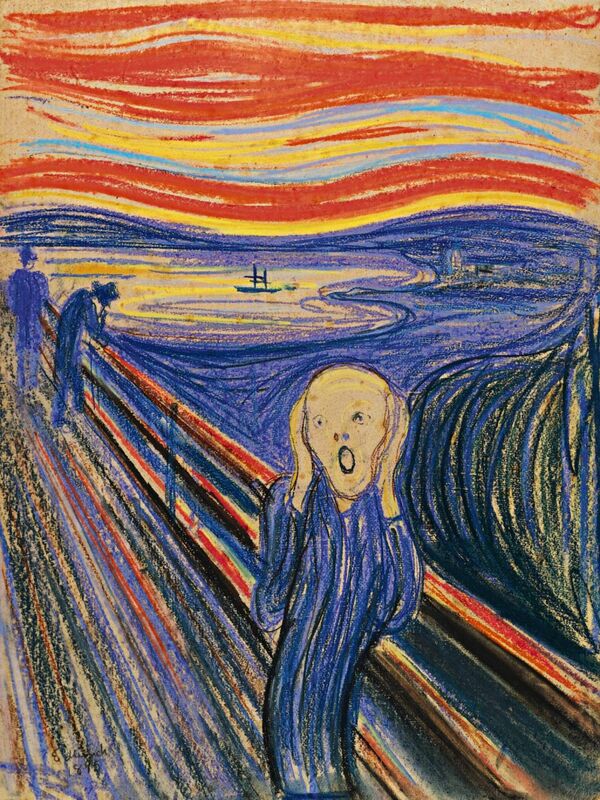 This pastel, one of four versions of Edvard Munch's The Scream, sold tonight at Sotheby's for a new world record for any work of art at auction - $119.9 million. Carol Vogel in the New York Times writes: "Munch made four versions of The Scream, three of which are now in Norwegian museums; the one that sold on Wednesday, a pastel on board from 1895, was the only one still in private hands. 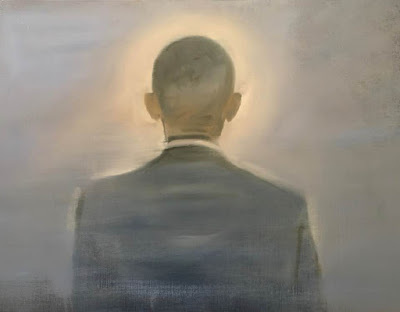 It was sold by Petter Olsen, a Norwegian businessman and shipping heir whose father was a friend, neighbor and patron of the artist." Today, I signed an historic agreement between the United States and Afghanistan that defines a new kind of relationship between our countries - a future in which Afghans are responsible for the security of their nation, and we build an equal partnership between two sovereign states; a future in which the war ends, and a new chapter begins. But over the last three years, the tide has turned. We broke the Taliban’s momentum. We’ve built strong Afghan Security Forces. We devastated al Qaeda’s leadership, taking out over 20 of their top 30 leaders. 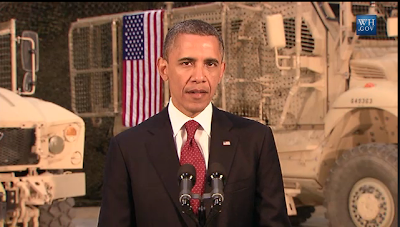 And one year ago, from a base here in Afghanistan, our troops launched the operation that killed Osama bin Laden. The goal that I set - to defeat al Qaeda, and deny it a chance to rebuild - is within reach. Third, we are building an enduring partnership. The agreement we signed today sends a clear message to the Afghan people: as you stand up, you will not stand alone. It establishes the basis of our cooperation over the next decade, including shared commitments to combat terrorism and strengthen democratic institutions. It supports Afghan efforts to advance development and dignity for their people. And it includes Afghan commitments to transparency and accountability, and to protect the human rights of all Afghans - men and women, boys and girls. Within this framework, we will work with the Afghans to determine what support they need to accomplish two narrow security missions beyond 2014: counter-terrorism and continued training. But we will not build permanent bases in this country, nor will we be patrolling its cities and mountains. That will be the job of the Afghan people. Fourth, we are pursuing a negotiated peace. In coordination with the Afghan government, my Administration has been in direct discussions with the Taliban. We have made it clear that they can be a part of this future if they break with al Qaeda, renounce violence, and abide by Afghan laws. Many members of the Taliban - from foot soldiers to leaders - have indicated an interest in reconciliation. A path to peace is now set before them. Those who refuse to walk it will face strong Afghan Security Forces, backed by the United States and our allies. Fifth, we are building a global consensus to support peace and stability in South Asia. In Chicago, the international community will express support for this plan, and for Afghanistan’s future. I have made it clear to Afghanistan’s neighbor - Pakistan - that it can and should be an equal partner in this process in a way that respects Pakistan’s sovereignty, interests, and democratic institutions. In pursuit of a durable peace, America has no designs beyond an end to al Qaeda safe-havens, and respect for Afghan sovereignty. As we move forward, some people will ask why we need a firm timeline. The answer is clear: our goal is not to build a country in America’s image, or to eradicate every vestige of the Taliban. These objectives would require many more years, many more dollars, and many more American lives. 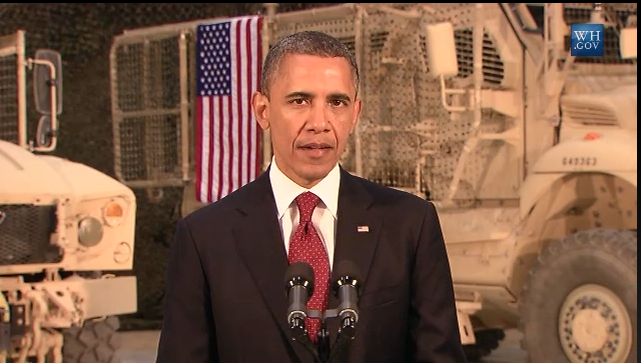 Our goal is to destroy al Qaeda, and we are on a path to do exactly that. Afghans want to fully assert their sovereignty and build a lasting peace. That requires a clear timeline to wind down the war. Others will ask why we don’t leave immediately. That answer is also clear: we must give Afghanistan the opportunity to stabilize. Otherwise, our gains could be lost, and al Qaeda could establish itself once more. And as Commander-in-Chief, I refuse to let that happen. I recognize that many Americans are tired of war. As President, nothing is more wrenching than signing a letter to a family of the fallen, or looking in the eyes of a child who will grow up without a mother or father. I will not keep Americans in harm’s way a single day longer than is absolutely required for our national security. 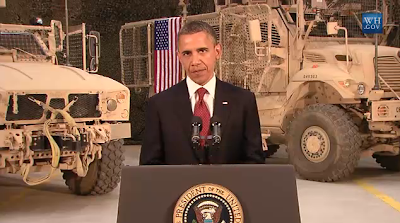 But we must finish the job we started in Afghanistan, and end this war responsibly. My fellow Americans, we have traveled through more than a decade under the dark cloud of war. Yet here, in the pre-dawn darkness of Afghanistan, we can see the light of a new day on the horizon. The Iraq War is over. The number of our troops in harm’s way has been cut in half, and more will be coming home soon. We have a clear path to fulfill our mission in Afghanistan, while delivering justice to al Qaeda. This future is only within reach because of our men and women in uniform. Time and again, they have answered the call to serve in distant and dangerous places. In an age when so many institutions have come up short, these Americans stood tall. They met their responsibilities to one another, and the flag they serve under. I just met with some of them, and told them that as Commander-in-Chief, I could not be prouder. In their faces, we see what is best in ourselves and our country. 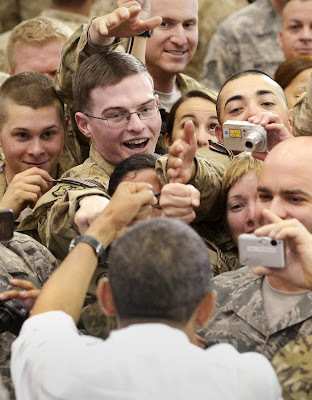 President Barack Obama greets troops during a visit to Afghanistan's Bagram Air Field on May 1. Our soldiers, sailors, airmen, Marines, coast guardsmen and civilians in Afghanistan have done their duty. Now, we must summon that same sense of common purpose. We must give our veterans and military families the support they deserve, and the opportunities they have earned. And we must redouble our efforts to build a nation worthy of their sacrifice. As we emerge from a decade of conflict abroad and economic crisis at home, it is time to renew America. An America where our children live free from fear, and have the skills to claim their dreams. A united America of grit and resilience, where sunlight glistens off soaring new towers in downtown Manhattan, and we build our future as one people, as one nation. Here, in Afghanistan, Americans answered the call to defend their fellow citizens and uphold human dignity. Today, we recall the fallen, and those who suffer wounds seen and unseen. But through dark days we have drawn strength from their example, and the ideals that have guided our nation and lit the world: a belief that all people are created equal, and deserve the freedom to determine their destiny. That is the light that guides us still. This time of war began in Afghanistan, and this is where it will end. With faith in each other and our eyes fixed on the future, let us finish the work at hand, and forge a just and lasting peace. May God bless our troops. And may God bless the United States of America.